An estimated 30%-40% of the U.S. adult population is affected with vein problems in the legs. However, most men are surprised to learn that, they too, can develop vein conditions they previously believed affected only women. While it’s true that cosmetic conditions, such as spider veins, arise mostly in women, there are other vein conditions — even painful ones — that occur more commonly in men, including the development of larger, bulging varicose veins. However, men are less likely to seek medical treatment for minor ailments, such as leg veins because they wear trousers and tend to have hairy legs, which cover up their varicose veins to some degree. In addition, men that suffer from varicose veins tend to have much larger varicosities than women and experience more symptomatic disease including throbbing, heaviness, pain and ulcerations. Varicose veins are abnormally swollen and tortuous veins. They are usually situated quite near the surface and are often visible beneath the skin. Varicose veins can vary in size from quite small (2-3mm across) to very large (2-3cms across). Patients may have no symptoms at all and may become aware of them solely by their unsightly appearance. However, they can also lead to a feeling of heaviness, swelling, aching, restless legs, cramps and itching. Symptoms are often exacerbated by standing, hot weather or exercise. Treatment options have improved significantly over the past few years, and men are now more willing to get rid of their bothersome veins using a routine office procedure called Endovenous Laser Therapy (EVLT). This procedure is covered by most insurance carriers for patients with significant symptoms who have failed attempts at conservative therapy. 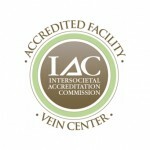 EVLT will eliminate all varicose veins in a single office visit with no downtime. Patients may experience mild bruising or swelling, but will be able to return to normal activities within a few days. Treatments should be performed by a vein specialist — a vascular surgeon or a Phlebologist (a doctor who specifically treats varicose veins). The service provided should be comprehensive and include an ultrasound vein mapping and an individualized treatment plan based on the ultrasound findings. Some patients are concerned that they may need their veins for possible heart or leg bypass surgery later in life. In fact, varicose veins are unsuitable for use in these situations. Varicose veins are diseased veins and would be detrimental to the success of these operations, where more healthy veins or arteries are required. It is also relatively uncommon for patients who have their varicose veins removed to subsequently require bypass surgery.